Both the electric guitar and the bass guitar have rich and colorful histories lasting more than half a century. 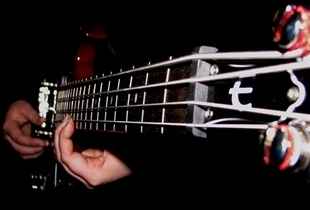 There are a number of obvious similarities between each instrument of course, but although the bass guitar is tied in closely with the electric guitar throughout the various stages of its development, it has also managed to carve out its own path to become a distinct instrument in its own right. Let's take a closer look at the more distinct characteristics of each. An electric guitar is typically constructed primarily out of wood for the neck and the body, which may be made out of a single solid piece of wood or several pieces of wood glued together. Some electric guitars may also be left hollow inside, making it more similar to an acoustic guitar in sound and appearance. 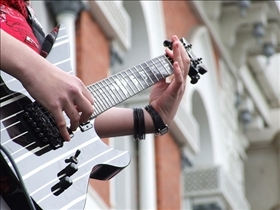 Some electric guitars are made out of materials, such as plastic, fiberglass, glass, metal and even stone. These are far less common however, and most electric guitars are made out of wood or a composite. Pretty much the same materials used in electric guitar construction is used in bass guitar construction. In fact, structurally speaking, the bass guitar is almost identical to the electric guitar, only with a longer neck, 4 strings instead of the usual 6 and a generally bigger body. Electric guitars come in two broad categories: hollow-body and solid-body. Hollow-body guitars came about from early experiments with attaching a crude microphone to an acoustic guitar’s sound-hole. This later evolved into the modern day guitar (or bass) pickup and served to amplify the volume of the guitar so it could be heard more clearly. Solid-body guitars came about when various builders and musicians realized that the use of the pickup rendered the hollow body unnecessary. As for the bass guitar, it was basically subjected to every innovation and adaptation done to the electric guitar. There are also hollow-body and solid-body bass guitars for instance, and there are also 5-string and 6-string variants, along with a few less common models with even more strings. The electric guitar is used for a wide variety of musical applications and it works equally well as a lead, solo, or melodic instrument, or for accompaniment supporting other lead instruments. The use of signal processing also allows the electric guitar to produce sounds that are far removed from the typical guitar tones. As for the bass guitar, its traditional role has mostly been that of a rhythm or backing instrument, although a number of musicians typically use it in lead, melodic and even chordal accompaniment settings. Best guitars players choose which guitar? Jackie Chan vs. Bruce Lee: Karate or Kung Fu?